Company’s software placed in the top nine most relevant business technologies in the UK by Innovation Launch Pad initiative. HotDocs Corporation, the global leader in automated document generation, today announced that its HotDocs software was one of just nine business technologies selected from a group of more than 350 for presentation to the nation’s top ranking civil servants and business leaders. 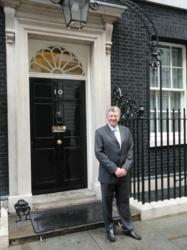 All presentations were made on July 19th in Whitehall, London followed by a reception in Downing Street. With the goal of lowering costs by up to 40%, the UK government initiated the Innovation Launch Pad program, which is designed to ferret out the best-of-the-best business technologies for use across government agencies. HotDocs Corporation is the recognized market leader in document automation and assembly software, serving over 1,000,000 users worldwide, including 80% of the Am Law 200, 20% of the Fortune 500, and firms, corporations, and government agencies of all sizes. Having pioneered the concept of automated document generation in the late 1970s, HotDocs Corporation is now a wholly owned subsidiary of HotDocs Ltd.